Wishing you a year of Nature's Euphoria! Wishing you a year of Nature’s Euphoria! This time of year you’ll hear the words “Happy New Year”. My wish for you is not only for happiness, but the physical, mental, spiritual well-being, creativity, tranquility, sense of wonder, and other benefits of being in nature. It’s something I call nature’s euphoria, others call it “Vitamin G”, (for Green space) or Vitamin N (for Nature). My wish is for everyone, but especially children and those who have experienced very little of nature’s euphoria. Many scientific studies have shown the benefits of being out in nature, and we probably experienced many without knowing it. I attended a “Healing Nature” symposium at The Chicago Botanic Garden and read the article in Outside magazine “Take Two Hours of Pine Forest and Call Me in the Morning” , and want to share some of these benefits with you. I invite you to read more about this subject, but more importantly, I hope you get out there!!! You don’t need travel very far to find nature. Illinois Nature Preserves are some of my favorite places to visit around here. 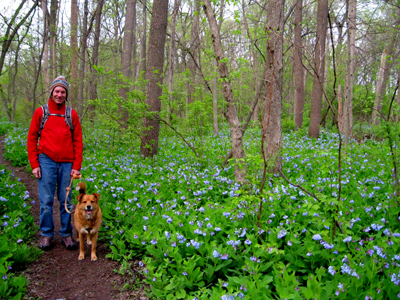 Getting our Vitamin N at Knock Knolls Park in Naperville, walking through the sea of Virginia Bluebells. Even my dog has a smile! In our fast paced, instantaneous, multi-tasking , techno-gadget world, being in nature helps us slow down, pay attention, and improves our memory. This triggers special neuron connections in our brain which aren’t being used as often anymore. To get the full benefits of nature, we have to experience nature first hand and be “present in it”. This means paying attention to what you are seeing, smelling, hearing, or feeling. Yes, put away your smart phone or ear plugs, for a little while. Rachel Carson’s “Sense of Wonder” is a great book about spending time in nature, especially with children. Although an urban or suburban walk is good, it really doesn’t have the same benefits as a walk through a natural area or being immersed in nature, according to studies. Often times when I’m feeling stressed and I can’t get outside, I recall some of my favorite memories of woodland or prairie places, and even this mental recollection has a calming effect. Try it! Enjoying nature in winter or in the rain has so many benefits even though we may be cold or wet. Outside Magazine says even a walk on a bad weather day has benefits. 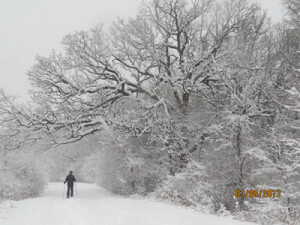 In winter, depending on the temperature, my husband often needs to coax me to hike or cross country ski through the local nature preserves, but afterwards, I always feel refreshed, energized, euphoric and glad I spent time in nature, despite the cold. 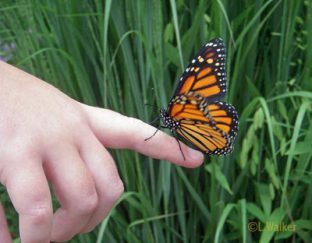 Even the sweet smell of a prairie and other nature scents has many benefits according to ongoing studies. I love the sweet smell of a prairie on a breezy day or a woodland just after a rainfall, don’t you? There’s even a name for this wonderful scent: petrichor. Just remembering these wonderful scents as I write this blog makes me feel more relaxed. Although most of the studies of benefits in nature focus on the forest in Japan, we know prairies, savanna, wetlands, woodlands and other natural habitats have the same benefits. I think if more people knew about these benefits, and we actually spent more time in nature, more folks would work harder to protect it. Folks might even be kinder and less aggressive, since studies show being in nature improves empathy and patience. I know this is true since some of my fellow nature buddies are the nicest people I know! Happy nature-related euphoria to you! glad to see your blog posting, many thanks!